Exceeds Industry standards for volumetric expansion ensuring accurate metering. Meeting requirements of EN 1360 for low temperature flexibility at -30C. Exceeds the cover abrasion requirements of EN 1761 for tank truck hose. For transfer and delivery of fuel oil and petroleum products for home, commercial, marine and industrial service. 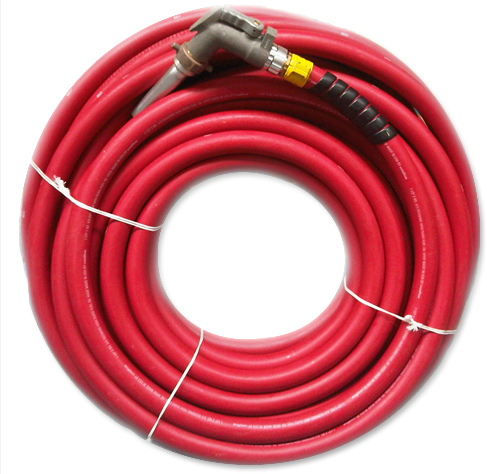 LIGHTWEIGHT, FLEXIBLE FOR EASY HANDLING: Redwing® hose is lightweight and flexible. The hose compounds resist stiffening, even in sub-zero temperature. LOWER OVERALL COST: Redwing® hose last long - for a high return on investment. Made to take rough handling, it is highly resistant to oil, scuffing and abrasion. Exclusive Chemivic® cover actually polishes itself with repeated use! It slides smoothly over the ground with minimum drag, reels on and off trucks with ease. MAXIMUM HOSE LIFE: The materials used in Redwing® Fuel Oil hose will withstand all fuel oil and petroleum based products - for long hose service life at low cost.